There’s a couple of classical concerts at the end of the month: not necessarily groundbreaking in what they play (although there is one premiere involved) but interesting in how they arrange their programme or in how they perform it. “Following his powerful staging of Janáček’s ‘Kreutzer Sonata’ with the Gildas Quartet at Conway Hall last May, John Landor returns with the quartet and the newly-formed Music-in-Motion Ensemble of thirteen string players to present an eclectic programme of music from Purcell to Pärt. What this means in practise is the exploding of the orchestral positioning and of orchestral uniformity – while retaining the hidden discipline of the orchestral units, the musicians wander out on their own across the performance space and through the audience as individuals rather than remaining en bloc, with each performer free (and encouraged) to act out the emotionality of the music. The set’s a selection of well-known repertoire war horses: the presentation and implications are less familiar. Since their formation in 2010, The Ligeti Quartet (violinists Mandhira de Saram and Patrick Dawkins, viola player Richard Jones and cellist Val Welbanks) have commissioned multiple new works and collaborated with artists from all types of musical backgrounds including Anna Meredith, Elliot Galvin, Kerry Andrew (Juice Vocal Ensemble, You Are Wolf), Laura Jurd, Meilyr Jones, Neil Hannon (The Divine Comedy), Seb Rochford (Polar Bear), Shabaka Hutchings (Sons of Kemet, The Comet is Coming), Shed 7 and Submotion Orchestra. They are currently working on a long-term project with Ernst von Siemens prize-winning composer Christian Mason to create a series of ‘Songbooks’ for string quartet, based on overtone singing traditions from around the world. For this performance, the Ligeti Quartet are performing traditional (20th century) and contemporary pieces. 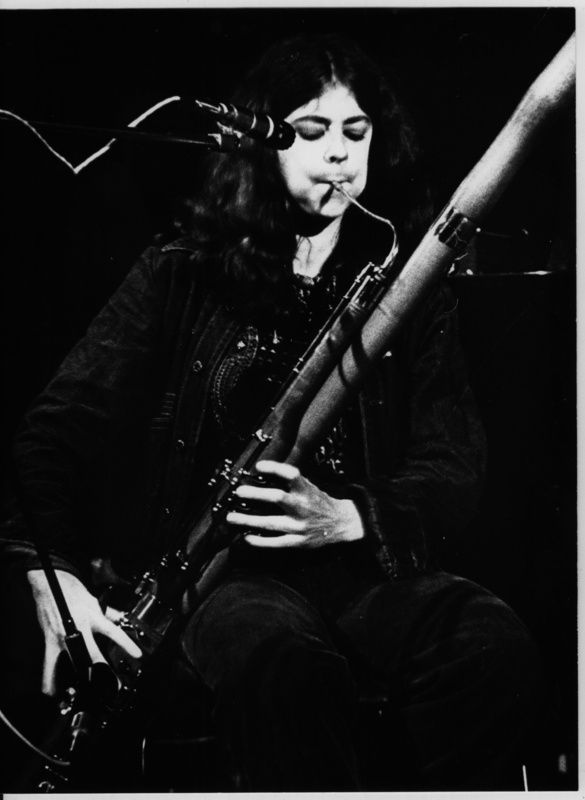 These include two Bach related works (a Sofia Gubaidulina tribute and a Birtwistle rearrangement of fugues, , a revival of the debut composition by http://www.plusminusensemble.com Plus-Minus Ensemble co-leader/Cut and Splice curator Joanna Baillie (originally written for Apartment House, and performed here in its 2006 string quartet version) and a brand new piece by former Unthanks member/ Streetwise Opera composer-in-residence/Timeline Songs director Stef Conner (whose body of work as a composer has revealed her as a walker and crosser of fine lines between classical, folk, jazz and antiquity). Wigmore Hall is devoting a whole day to the work of Scottish composer Helen Grime, who’s about to begin her term as the Hall’s first female composer-in-residence for the 2016/2017 and 2017/2018 seasons. In the evening, the Birmingham Contemporary Music Group and conductor Geoffrey Paterson will take over the hall for a double triptych of music by Helen and her influences. From the press release: “Helen Grime’s ‘Seven Pierrot Miniatures’ (NB – a companion piece to Schoenberg’s ‘Pierrot Lunaire’) project the composer’s uncanny feeling for instrumental tone colours and textural contrasts, whilst her ‘Clarinet Concerto’ (to be played by soloist Mark van de Wiel) is a study in virtuosity that grows more meditative as it unfolds. 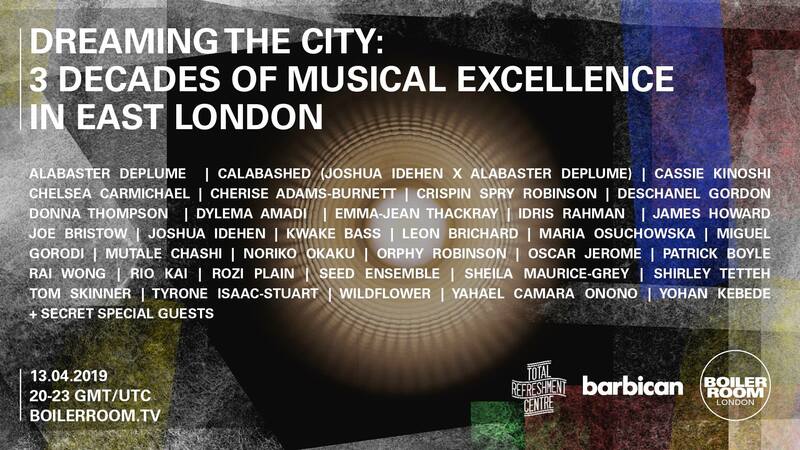 Oliver Knussen and Elliott Carter have been formative influences in Grime’s career; her duo ‘Embrace’ picks up the duos in Knussen’s delightful ‘Songs without Voices’, and the Carter duo, written for Knussen’s 50th birthday, mirrors this.” There’ll also be a performance of Leoš Janáček’s woodland fantasy ‘Concertino’. In between the concerts, at 6.00pm, Helen will give a forty-five minute talk. In between the previous two shows, The Ligeti Quartet are touring their interesting ‘Fellow Travellers’ programme at a couple of English venues. 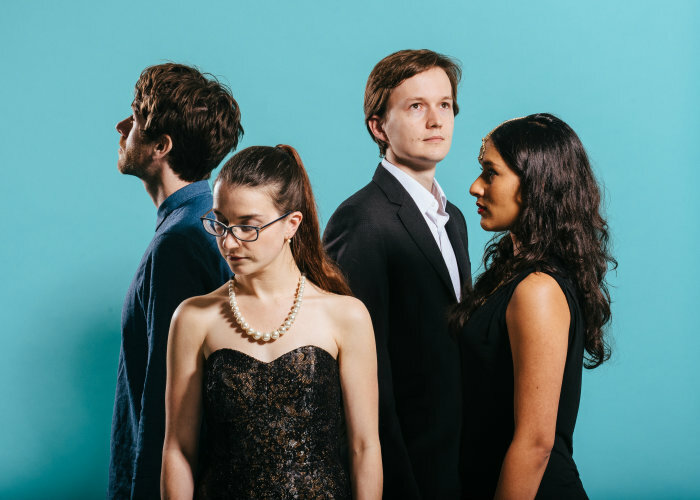 “The Ligeti Quartet – consisting of violinists Mandira de Saram and Patrick Dawkins, viola player Richard Jones and cellist Val Welbanks – is dedicated to performing modern and contemporary music, commissioning new works, and engaging a diverse audience. Formed in 2010, they were united by their fascination with the music of György Ligeti, and have since established a reputation as leading exponents of new music. 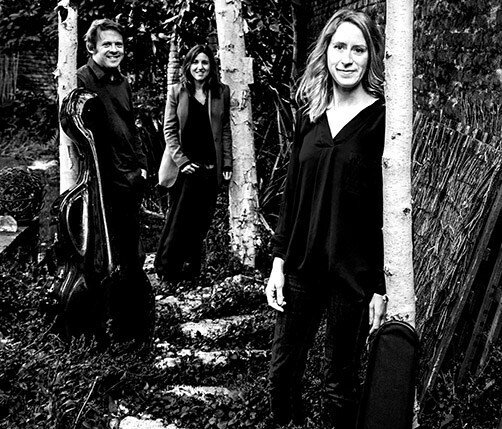 The concert also includes quartet works by the polystylistic pioneer Alfred Schnittke, the polymathic jazz-and-classical composer John Zorn (from a set of intricate, witty compositions inspired by the rules and forms of sadomasochism), and the premiere of a new Duke Ellington-inspired quartet composed by another jazz musician, Laura Jurd (who’s also on tour this month). In addition, the Quartet will be playing another show at the end of the month, in Aberdeenshire (as part of the ongoing Scotland-wide Sound Festival). 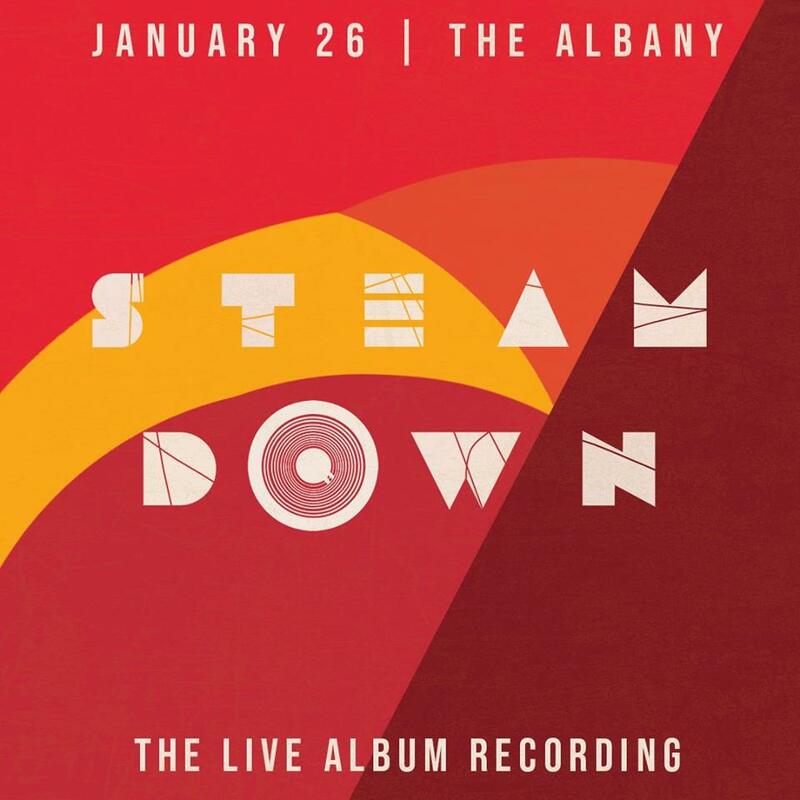 This show will feature a different set, although one which illustrates the Quartet’s interests and preoccupations with modern and twentieth-century music.